We have something new in mind, something we cannot tell you about yet. The “thing” involved another trip the the Atherton Tablelands, which we enjoyed, in spite of the rain. Besides, it was Nico’s first long trip and I’m sure he really enjoyed it, since he was asleep most of the day. Surprisingly, it was even difficult to wake him up for a feed. But he made our day extremely easy. And it was my first time in Steve’s new Mercedes van. What a day! We visited the Yungaburra markets, which happen the last Saturday of each month. We will have to go back, since by the time we got there they were already closing. They are very good, with lots of homemade and local produce, food stalls, etc. Really worth a visit if you are in the area the right day. Our next stop was Mungalli Creek Byo-Dynamic Dairy. They produce their own milk, cream, yogurt and cheese and all I can say is that everything we have tried there is absolutely delicious. Even though we can get their products in the supermarket, it is always very interesting and exciting stopping at their farm in the Tablelands. I went for the carrot and ginger cake, Steve tried their fantastic cheese soufle and little Nico decided not to risk it and have his usual. As you can see, he didn’t regret his choice. And after roaming the roads enjoying the scenery, very green after so much rain, we had to go back home to take care of our digital underwater camera rental business. We all enjoyed a day out!!! Byron Bay was amazing. Stanthorpe had been cloudy and kind of cool for a couple of weeks. Now that we live in a tropical climate, we are not used to the cold. And we didn’t think for one second that the sun wasn’t going to shine, so we hadn’t even brought a jumper with us. I had to borrow Steve’s Mum’s clothes. 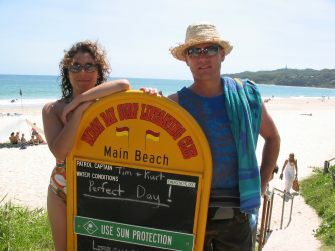 So we headed south to Byron Bay looking for a bit of sunshine and warm weather. On our way to Byron Bay we could see that we were leaving the clouds behind us. What a treat. The city was really busy, but what can you expect the week before Christmas? People everywhere: shopping, eating, drinking, sunbathing or having a swim. Our main reason for driving all the way to Byron Bay was to visit all the backpackers hostels in town. We have designed a promotional poster for Cairns Unlimited as well as free postcards promoting our DIGITAL UNDERWATER CAMERA RENTAL business and most of the hostels managers were kind enough to put them up for us. After such a tough job, we headed for the beach. Compared to the beaches of Tropical North Queensland, Byron Bay beach was wild. Thanks to the Great Barrier Reef, the water in the north is really calm and hardly ever there’s a wave. Completely different in Byron Bay. We jumped, dived, splashed each other, were thrown underwater for a few seconds, but mostly we had a terrific time. 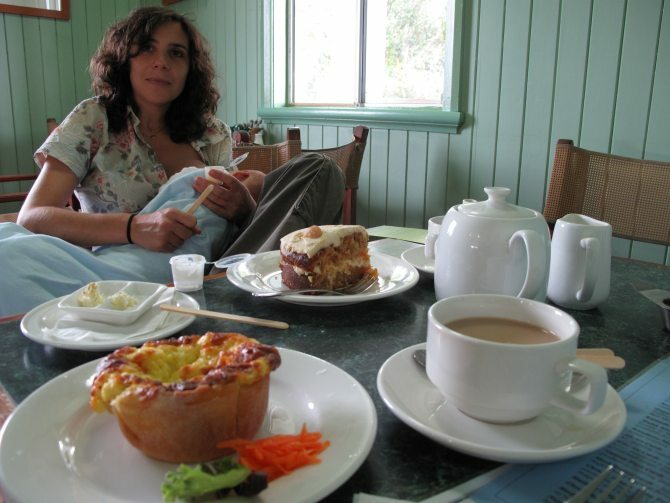 A shame all the backpackers hostels were completely full and the only rooms we could find were outrageously overpriced, so we came back to Stanthorpe that night. We forgot to take our camera with us, but here you have a photo we took in Byron Bay a couple of years ago, when we came to spend our holidays in Australia. And now we are getting ready for Christmas, only in a couple of days time. To me it is still weird to celebrate Christmas without my scarf, gloves and a coat. But I must say it is nice.